Sometimes called a couch or a davenport, a sofa is a long upholstered seat with both arms and a back. Today, it is a common luxury that indicates humans' progression away from the nomadic "pack and evacuate" lifestyle of our recent past. Upholstery technically dates back to ancient Egypt, where pharoahs' tombs were furnished with comfortable appointments preserved to last a millennia. Ancient Egyptians and their Roman contemporaries reserved such items for royalty and other social elites. In the West, upholstery as we know it today developed slowly as building architecture improved. Prior to the 1500s, woven artifacts known as tapestries were the main source of insulation, protecting inhabitants from the damp and cold, that seeped in through their walls. Seating for two or more people was usually supplied by a hard bench. Once the need for protection from the elements decreased, fabrics could be used for decoration and on individual pieces of furniture. Contributions to interior design were made from all major European centers. Germans introduced the use of horsehair padding, still a central feature of properly upholstered furniture. The English preferred dried sea moss. Italians introduced backrests and arms during the Renaissance. Upholstered chairs had been invented already, but were not popularized until this time. The sofa with a down cushion was an extension of the upholstered chair. Minor adjustments were made to stuffing methods, such as using buttons to secure padding rather than the practice of "tufting" (sewing raised loops or cut pile into the fabric). The eighteenth century "upholder" was a combination designer and decorator who completed an architect's vision of a room. Cabinet makers like George Hepplewhite, Matthias Lock, Henry Copland, and the far more reknowned Thomas Chippendale extended their woodworking enterprises into this new and exciting field of upholstery. A rash of what were called "pattern books" by these and other practitioners, with such names as The Cabinet-Maker and Upholsterer's Guide, set the pace. They contained sofa designs as well as new ideas for other practical and decorative pieces. During the nineteenth century, the advent of industrial technology had a major impact on modern methods of upholstery. In 1850, coil springs were invented. A modern sofa typically, though not always, contains springs to even out weight distribution. The sewing machine was also developed during this period, speeding up the upholstery process. New improvements such as modern welting would not be possible without the sewing machine. The frame of a sofa is made most often wood, though newer options include steel, plastic, and laminated boards or a combination of the above. Kiln-dried maple wood deemed free of knots, bark, and compromising defects is used under the upholstery. The show wood of the legs, arms, and back can also be maple, but sometimes mahogany, walnut, or fruitwoods are used for carved legs or moldings. Padding is primarily made from animal hair, particularly hog or horse. Other paddings used in mass production are foam and polyester fiberfill wrap. Some preprocessing may be necessary, as with the prematted rubberized hair, where animal hair is arranged and bonded into shape with glue. Cushions are fashioned from polyurethane foam, polyester fiber, down, cotton, latex, or cotton-wrapped springs. A sofa may be covered with any choice of synthetic, natural, or blended fabric. Wool and nylon are the best choices in their respective categories of natural and synthetic fibers, but cotton, acetate, rayon, and polyester have their own functional properties. Exterior fabric may be finished with a protective anti-stain coating. When used, springs are made of tempered steel. A typical sofa calls for 15 yd (13.71m) of burlap and at least 10 yd (9.14 m) of muslin for the interior. All materials are fastened with approximately 1,000 or more tacks, over 200 yd (182.8 m) of twine, and hundreds of yards of machine sewing thread. Sofas come in three major sizes. The full sofa is 84 in (2.13 m) wide. Smaller versions like the two-seater and love seat range between 60-80 in (1.52-2.03 m). Variations on the standard sofa include modular items and sofas with special uses such as daybeds or convertible sofa beds. Ornamental designs are not necessarily less durable, but they do not invite casual use. The design of a sofa can be adjusted to the use that will be made of it, and the average size of the people who will use it most. A deep seat, for instance, is good for taller people but does not easily accommodate shorter individuals. The style of a sofa is generally set by its arms, which double as artistic statements and rests. Some styles of seating furniture are known by the names of these arm designs. The overstuffed sofa is called that in the trade in order to indicate the use of more than one layer of muslin in the foundation. 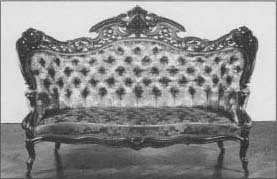 A traditional Victorian sofa purchased as part of a parlor suite by Mary Todd Lincoln after her husband's assassination. After President Abraham Lincoln's assassination, his wife, Mary Todd Lincoln, purchased an expensive parlor suite for use in her new life as a widow. The suite included a sofa, table, two arm chairs, and several side chairs, and was probably manufactured by J & J.W. Meeks of New York. Epitomizing the Victorian era, the sofa represents the ultimate in mid-nineteenth century comfort and decoration. The technology of the time allowed for the use of coil springs, giving the seat a cushion-like softness that returns to its taut shape as soon as pressure is removed. New technologies also gave way to the lavishly carved show wood on the back. Ordinarily, the almost three dimensional fruit and flowers design would split the wood, however thin layers of rosewood were cross-directionally glued together to form a stronger wood laminate able to withstand the carving. Once glued together, the entire lamination was steamed and forced to curve with the back of the sofa. The bent plywood system would be utilized again (100 years later) by Charles Eames in order to create his famous chairs. They would be the stylistic antithesis of Mrs. Lincoln's ornate Victorian sofa, but just as chip and crack resistant. factory production become most obvious. Classic hand-tied springs, for instance, may give way to a mechanically attached spring grid if recent factory practice becomes the norm. Such industrial reforms have sparked controversy. The following breakdown is modeled after the handmade process that still defines the industry. 1 First the frame is constructed from wood that has been found clear of any defects. The thickness of the wood should allow for the heavy tension webbing to follow. If the frame is not sufficiently strong, it will not bear the weight redistributed into it by the webbing whenever someone sits down. Arms, back, or back sections, seat, and legs are attached. The preferred method is with clean-cut, fitted double doweled glue joints reinforced with comer braces, glued and also screwed into place. Each major part of the sofa will have to have springs attached separately, and also be padded separately. Consequently, they are "framed out" with reinforcing slats, arranged around the seat section. 2 The foundation is then set for padding. Jute, a kind of burlap made in India, is used as webbing. Strips of this material are interwoven, stretched across the frame, and tacked down. Flax twine is then used to strap the springs onto the webbing. Two lines of twine are tacked into position and then tied around a spring back to front. Another pair of lines will run side to side on each row of springs after all the springs have been lashed into position individually. If heavy-gauge springs are used in the "front row," these are further tied down with a length of wire. This process is repeated for the back, with special attention to the springs at the base, which are treated like the front row of seat springs. If the back comes in sections (sometimes three for design purposes), then each part is separately tied off and the twine ends tacked onto the four-sided frame. The same is true for any sides and arms. Each part will be wrapped in its own sheet of burlap after being completely fitted with secured springs. The burlap is cut to size for each part, tacked into place initially, and then tightly lashed to the springs to minimize movement. This is to prevent the springs from wearing through the burlap over time. of padding is distributed over the whole area of the seat, extending over the roll. The layer is basted into place with long, loose stitches and covered with lighter weight burlap. Tighter stitching divides the seat into two areas called the platform and the nose or front edge. This front part is reshaped with hand stitching. After the shaping is completed, a final, thicker layer of padding is added to fill in dips left by stitching in the burlap, and basted like the previous layer. A muslin sheet of covering is applied, stitched into the break between the platform and nose, tightened across the front edge and back across the platform; its edges are tacked into place. Anomalies in the padding are addressed before proceeding. 4 The arms are done next in the same basic fashion. Layers of padding and burlap are fixed in succession and topped with muslin. The arms also have a front edge of extra thick padding. Once the arms are properly shaped the back or back sections may be padded. If there is more than one part to the back, the center is padded first up until the second burlap layer. Then, the two flanking sections are padded up to that point, to match the center in size. The edge roll is formed around the top and back of the crest rail or uppermost part of the frame, or the corresponding area of each of the back parts, each of which must be kept parallel to the others. After inspecting and making any adjustment to the padding, the exposed wood parts can be stained and finished to taste or design specifications. 5 Every piece and panel that will be fabric covered must be measured and recorded in a cutting list. The fabric is purchased in one piece or lot. The panels are then plotted out in chalk so they match wherever their seams will meet when finally applied. If any of the panels and pieces need to be sewn together before being attached to the padded frame, this is taken care of first. The seat is covered with panels for the platform and nose and hand-stitched into place along the break between them over a layer of cotton batting. The nose is then covered first to check if the pattern continues along the front properly. The covering is fitted over the back or platform end and secured. The arms are covered next after being prepped with their own layers of cotton batting. A fan-pleated arm is a classic look. The fabric is folded into place around the front roll, in a series of pleats that look like an opened fan when finished. A series of strategically placed cuts may be made, so the fabric clears all obstructions presented by the frame. The top, bottom, back, and pleated front are operated on in succession. Temporary tacks are replaced one by one with permanent tacks. 6 Other parts to be covered, like the back or its sections, may require machine sewing and the attachment of pull tabs that will allow the fabric to be stretched between frame slats and secured. Cotton batting is layered on as well, and the appropriate panel of fabric laid down, basted, stretched fully into place, and fixed with tacks. The outside is the last part to be padded and covered, starting at the arms. The open area is covered with a layer of burlap, an outside cotton padding, and finally the finishing fabric. Covering is fabric-stitched on top and tacked into place on the bottom, front, and back. The largest panel left open is the outside back. If the webbing has left any gaps between frame slats, these must be stuffed. Padding should be basted over the gaps along the whole outside back. The fabric panel for this section may be welted, or edged with a decorative strip made of stuffing cord covered in matching fabric. The covering is basted, then sewn at the top and tacked at the bottom as with the other parts. 7 After the sofa is flipped and covered at the base with a cambric (dust cover), finishing touches are then applied. The sofa may be fitted with one of several choices of skirt. Arms may be supplied with welted panel covers. Cushions are made separately to cover the seat. These are constructed most often from a jacket of ticking, encasing two pads that in turn frame an inner core of foam. Each one is covered with finishing fabric panels supplied with a back zipper, so the case can be removed for dry cleaning. Sofas continue to be made by individual craftsmen and small workshops as well as factories. 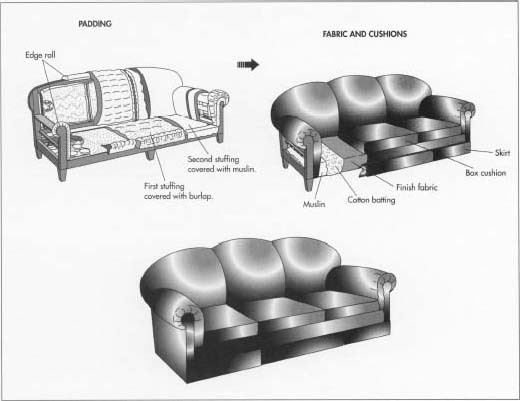 There are different ways to learn how to make sofas and other upholstered items. North Carolina State University offers an industrial engineering bachelor's degree that specializes in furniture manufacturing. In addition to courses in product engineering and facilities design, they sponsor field trips to local factories and workshops in industry-specific computer applications. Beard, Geoffrey W. Upholsterers and Their Work in England: 1530-1840. Yale University Press, 1997. Brumbaugh, James E. Upholstering. Audel Books, 1992. Gheen, W. Lloyd. Upholstery Techniques Illustrated. Tab Books, 1994. James, David. Upholstery: A Complete Course. Sterling Publishers, 1993. Zimmerman, Fred W. Upholstering Methods. Goodheart-Willcox Co., 1992. Colborn, Marge. "Is This A Good Sofa?" The Detroit News Homestyle Section, August 3, 1996. UIU Journal/Upholsterers' Journal. Upholsterers' International Union of North America, 1922-present. Upholstering Today/Furniture Today. Communications/Today Ltd., 1986-present. Joines, Jeff. "FMMC Sponsored Field Trips." March 1996. http://www.fmmcenter.ncsu.edu/education/fumcomp.html (July 14, 1997). Wright, Monte. "Heirloom Upholstery's Introduction to Upholstery Home Course" (video and companion booklet). I am doing a project for school on interior design and sofas and the history of interior design and sofas and i wanted to say this website was EXTREMELY useful and gave me all the information i needed! Thanks! I m a student of interior design and what I think for this site is that it is help full for the students of Interior as well as furniture.I APPRICIATE these kind of sites. I am learning to design furniture framing and sofa design is very important with custom furniture. This has been VERY helpful.